Using an external memory stick. Using a cloud service (like DropBox or OneDrive). This feature can also be useful if you wish to share your data with another person who is also caring for the creation of schedules using Meeting Schedule Assistant, or is taking over your assignment of creating rosters and Schedules. The data that is stored includes every setting that you have adjusted within Meeting Schedule Assistant to suit your personal preferences, and is stored in ZIP format. 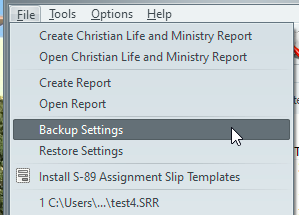 The S-89 assignment slip template files will be included in the ZIP archive. If you want to keep the size of the ZIP file as small as possible then please only keep the required slip data files in the template folder. For example, the files for other languages can be removed.